We’re all about 2 weeks into our New Year’s resolutions, right? They’re the usual eat healthier, exercise more, drink less, yada yada yada. Each year I try not to have the same resolutions as the year before, and sometimes I try to not to have any at all- it’s just so cliche. But, this year, I really do need them. As is too common, I do need a reset. In fact, my whole family does. Although, overall, we eat a pretty healthful, balanced diet, we’ve gotten into some bad habits lately and need to get out of them. We do need to eat healthier. We do need to exercise more. My husband and I do need to drink less…or maybe just eat healthier and exercise more, let’s not go overboard. One of the best (and easiest) ways to make the adjustment to healthier eating is to start with your first meal of the day: breakfast. It’s often an overlooked meal, but really is the most important one. It starts you off and lays the foundation to how your day will go. It has the ability to alter your mood, energy level, and therefore attitude and eating habits for the rest of the day. If you eat a nutritious, satisfying breakfast, you’re less likely to grab that unhealthy midmorning snack. You’re also less likely to experience the midmorning slump, which can then lead to poor lunch choices. When we feel sluggish we tend to want comfort food: salty, fatty, empty carbohydrates. But if we feel satisfied in the morning, if we feel energized and good about ourselves, we want to keep that feeling going and end up making healthier choices throughout the day. 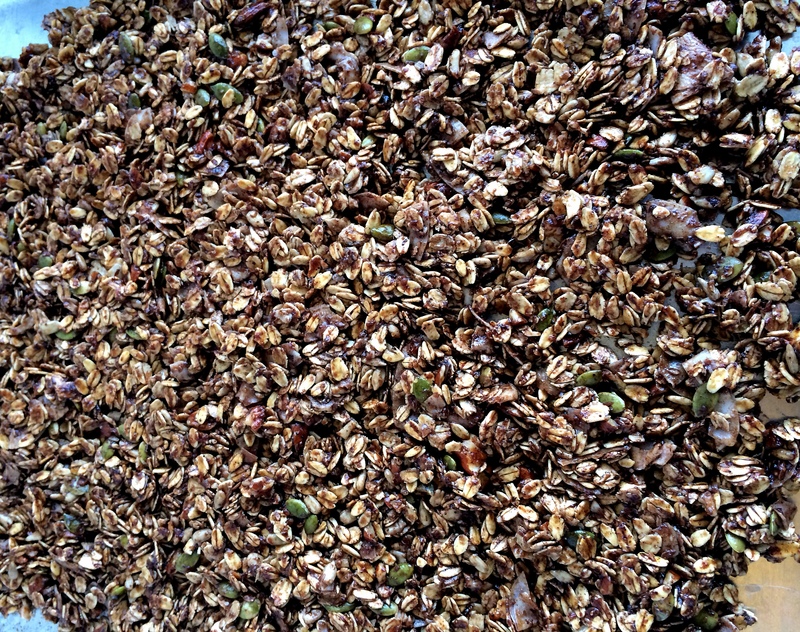 This granola is packed to the brim with nutrition. It’s loaded with whole grain oats, protein-packed nuts and seeds, heart-healthy flaxseed meal, and tons of fiber from the oats, flaxseed meal and toasted wheat germ. 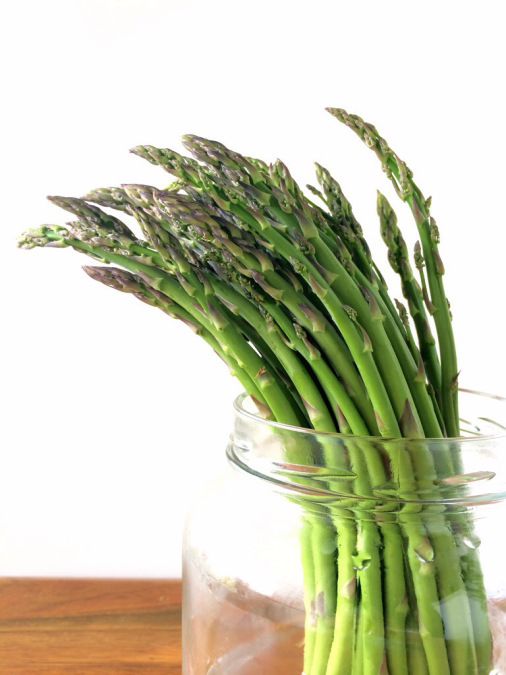 You also get vitamins E and B1, zinc, magnesium, copper, and folate from these superfood ingredients. Coconut oil, once thought to be a harmful fat, is now known to help increase metabolism, energy and endurance. It also helps control blood-sugar and aids our bodies in fighting off viruses and bacteria that can cause illness. 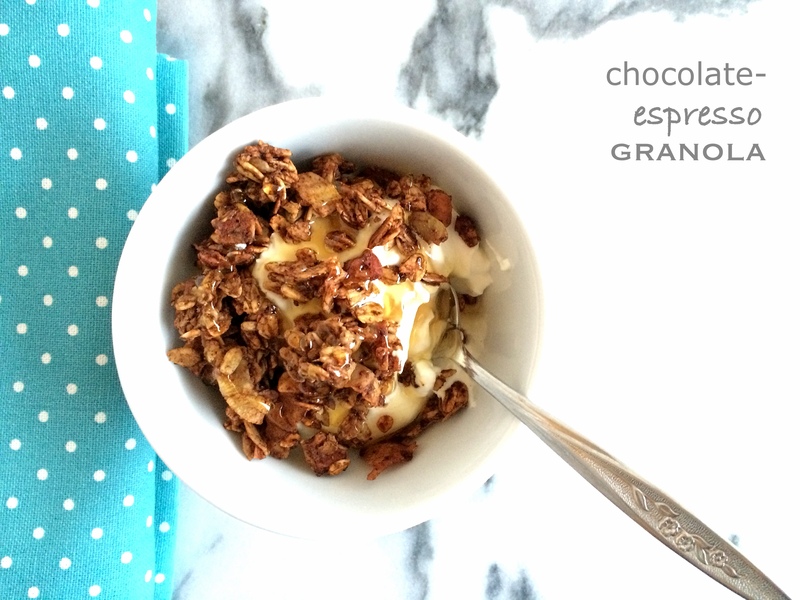 The cocoa and espresso powder give the granola flavor, essential minerals, and a little caffeinated zip. Honey is a natural sweetener and contains antioxidants. Cinnamon, one of the world’s oldest spices, can help reduce LDL cholesterol (the “bad” cholesterol), aid in digestion, and is an anti-inflammatory. 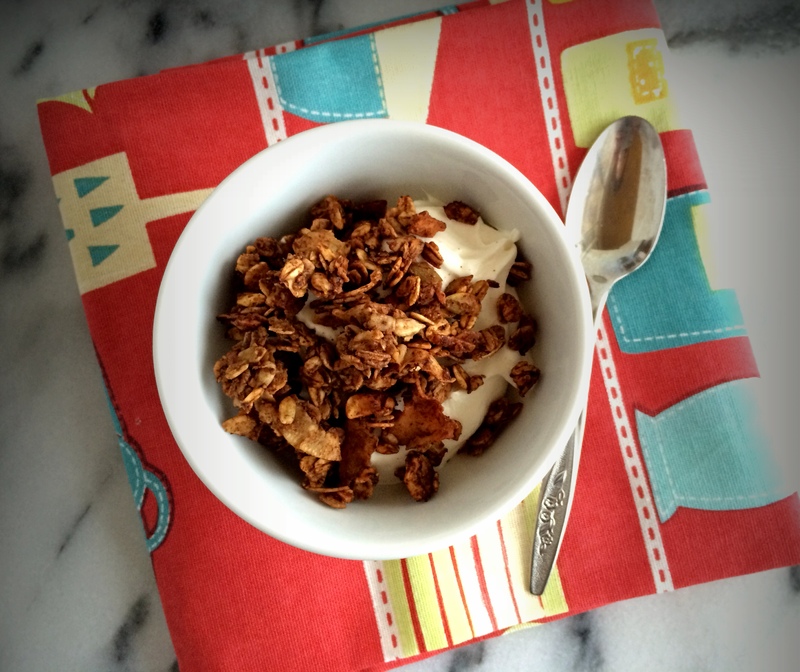 And with some yogurt and fresh or dried fruit, this granola is the kitchen sink of nutrition. It will power-punch your morning in the face. 2014, it’s on. Let’s do this! Preheat oven to 350 degrees. 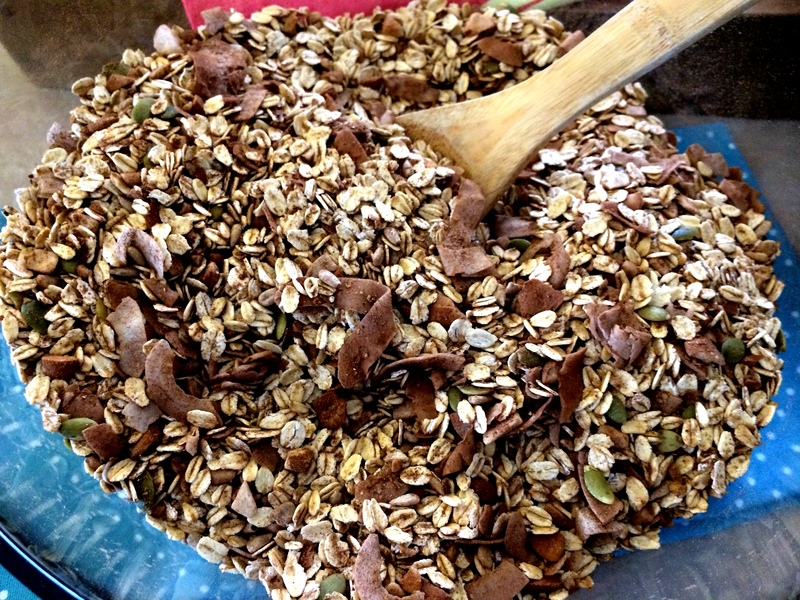 In a large bowl, combine the dry ingredients (oats through cocoa powder). In a small bowl, whisk together the egg whites, oil, honey and vanilla. Add the wet ingredients to the dry ingredients and stir until well combined. 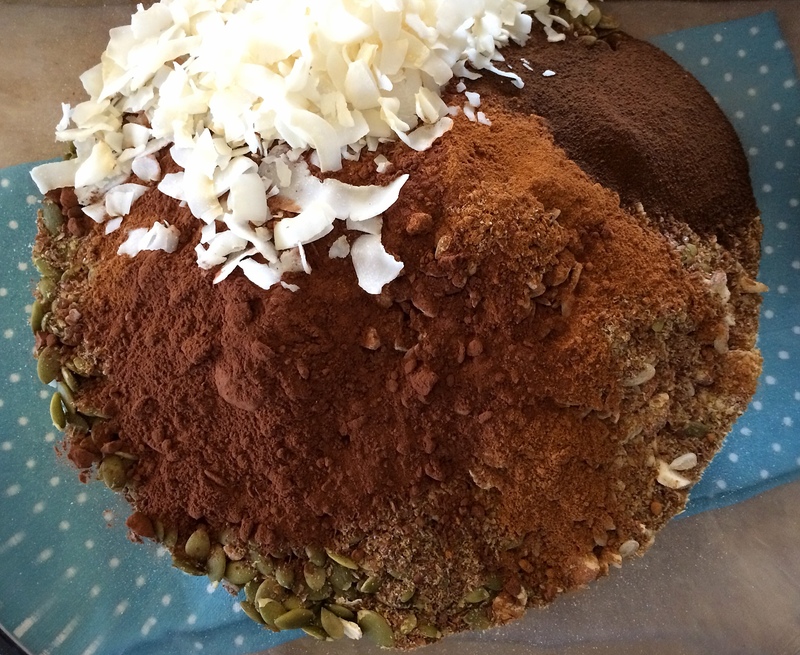 Spread the mixture onto two large, rimmed baking sheets in an even layer and bake for 20 minutes. 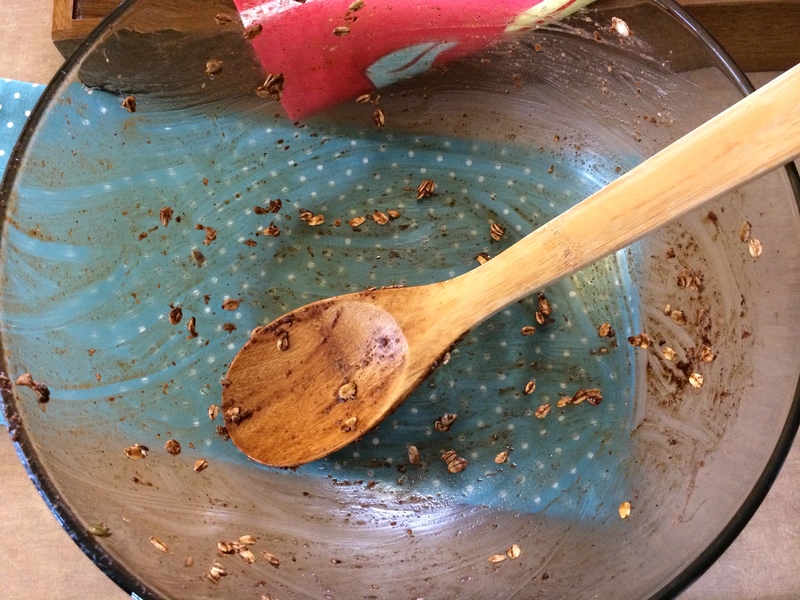 Remove the pans from the oven, carefully flip the granola over with a spatula, and bake another 10 minutes. Cool completely on pans, then transfer to jars for storage. 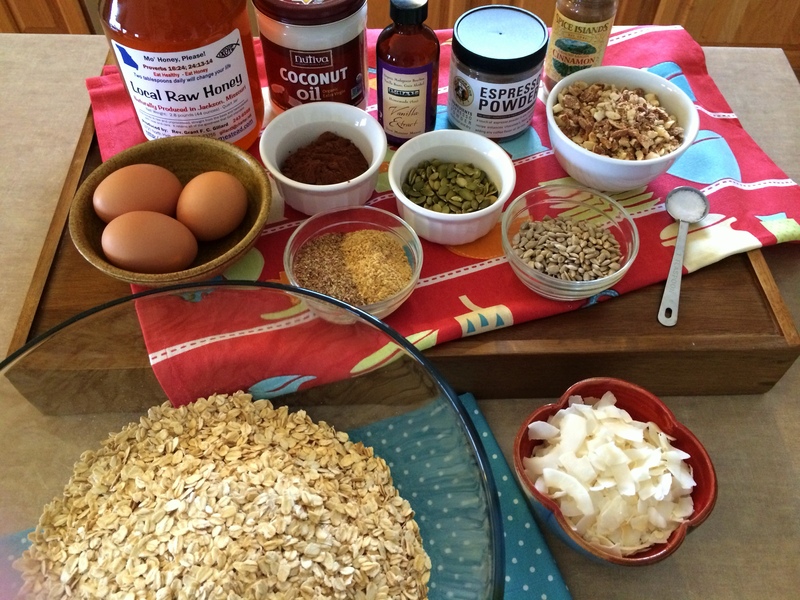 The granola will harden and become crunchy as it cools. Serve with yogurt, dried fruit, and a drizzle of honey. Enjoy!